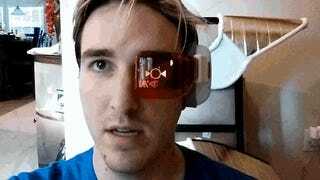 Dragon Ball Z fans are more than familiar with the scouter — the head mounted display that many characters in the series used to measure their opponent's power level. Now, one hero tinkerer has made that prop a reality. Oh sure, it won't be able to measure your real power level (for the record, it's probably 5). And yes, similar products exist, but Kier Simmon's scouter (made from "an old 80's radio scouter") actually takes the idea to where we've always wanted, giving it a fully functioning display with animations. Bulma and the Tuffles would be more than proud. You may now proceed to throw money at your screen until this thing actually exists in mass production.